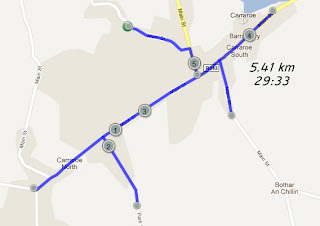 I finally started to scale back my runs as the Galway Bay half marathon comes up on the 1st October. I opted for a short run on Thursday and went and took the local loop just to keep the legs going. I figured a short run was the order of the day, just to avoid the laziness as I was spending the weekend away from home and knew a run wouldn't be on the cards. I got down to my usual start spot in Carraroe and started out on the road, taking the usual gradual incline up towards the top where the road would turn into Caladh Thaidhg, turning and heading down towards my local pitch, and back towards the centre of the village and out towards the lake where I would turn back and head towards home. While this may not sound like much, its a good 5.4 km to loosen the legs up, plus cleared my conscience as I spent the weekend on every food and drink that was anything but healthy :) Ah well, no harm every now and again i guess!! The main thing now as the Winter approaches will be to make my runs earlier in the day, there's a limited amount of running you can do under street lights before tedium starts to kick in!! You're right, Máirtín, I don't like running in the dark although sometimes I am compelled to do it (for job or family). It this cases I try to run slowly (better than nothing) because I have to see the ground. Good luck on your "Galway Bay half-marathon"! I will be looking forward to reading your race report! Thanks Giorgio,its tough finding time during the day for runs so will need to make time this Winter. Looking forward to the half marathon on Saturday,hopefully will be a good result.